A Rather Catholic Oriented Theme Blog. It was in the Old Testament Reading where The Prophet Elias(Elijah) came into a house where a widow’s young child had died. He took the child into an upstairs room, put the child on a bed & put his body over the child Three Times. The child came back to life. In The Gospel according to St Luke, the son of a Widow had died. Jesus came into the house and raised up the son. Both are Miracles. Both prefigure the Death and Resurrection of Jesus. Mother Mary Theotokos was also a Widow. The Third Miracle occurs at EVERY Catholic Liturgy in The World, as the Offered Bread and Wine becomes The Body & Blood, Soul & Divinity, through the action of The Priest, acting in Christ’s Person as an Alter Christus. This does NOT occur in most Protestant Ecclesiastical Communities because most of these Communities have no VALIDLY Ordained Priesthood. Mater Dei, Ora Pro Nobis! First Friday was Novus Ordo, as was Saturday, which is called Saturday of Our Lady. Today is the 1st Sunday. It is also the Fourth Sunday In Lent, called Laetere Sunday, which is a Lenten Sunday of Joy. It means that Easter(Pesach) is Nigh. 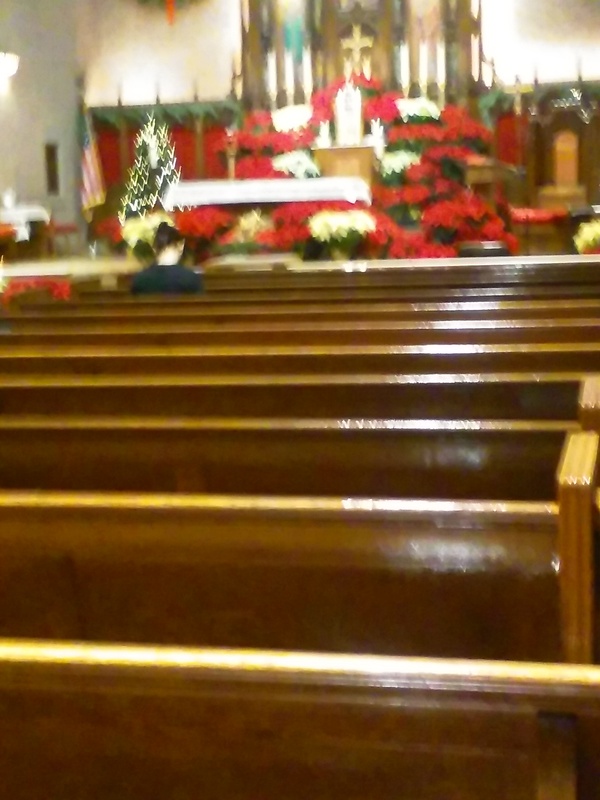 And I was at St. Agnes on E43rd Street in Midtown Manhattan. Friday, March 4th at 8:00AM & The Mass Celebrant was the Most Reverend Paul Sanchez, aided by the Pastor Emeritus of St. Vincent Ferrer Parish in Brooklyn, Monsignor Fursey O’Toole, Irish Born. The Gospel was the Greatest Commandments, both of which summarize the 10 Commandments. As Jesus said “Thou Shalt Love The Lord Thy God, With All Thy Heart, With All Thy Soul, With All Thy Mind & With All Thy Strength. The Second Great Commandment is “Thou Shalt Love Thy Neighbour as Thyself.” An Example of “Love Thy Neighbour” was given at The 12:05PM Mass by Our Lady Queen of Martyrs Administrator, Fr Frank Passenant & it was an Excellent Example. We don’t always look at Our Parents as Neighbours, but they are the Neighbours closest to you. Hey, They’re Neighbours by Blood. Pray For Them, both Living & Dead. First Saturday at the 12:05PM Mass was offered by Fr Frank Passenant. This is the Story in The Gospel of The Pharisee & The Publican. The Pharisees were the Learned Religious Men. They were The Priestly Class of Judaism. But, they were NOT always known for their Humility. Everything was OUTWARD, but not always INTERIOR. Publican is a Nice Name for The Most Hated of Roman Officials, namely The Tax Collector. Many of these Men were conmen, often taking more than what was due. For the Tax Collector was one who often lived like a Fat Cat. For he was a Private Contractor for the Roman Empire, who often took Liberties beyond what was due. And One of The Original 12 Apostles, Matthew, was originally a Tax Collector. He was also one of The 4 Evangelists in The Writing of The Gospels. The Publican received God’s Mercy. The Pharisee only got the Admiration of Man. For Today on Lautare Sunday, as this is the Sunday indicating, that The Joy of Easter is Near, hence Vestments in the Bright Colour of Pink, Today’s Gospel for The Tridentine Latin Mass is The Miracle of The Loaves Of Bread & Fish. It was only 5 Loaves of Bread and 2 Fish, yet there was enough left over to fill 12 Baskets. There were 5,000 Men who were fed. This was The Miracle of The Loaves & Fish, and Jesus Multiplied the Loaves & Fish. No one left hungry. Three Days, Four Masses & The Good News, The Gospel Of The Lord Jesus Christ! In short, I am staying here in Queens, in Forest Hills instead of running by Subway to Manhattan. The Weather plays a part in it as it is snowing. So, a Doubleheader of Masses at Our Lady Queen of Martyrs in Forest Hills, Queens, instead of running to Midtown Manhattan, will be what I do, today. I have to head to Stations Of The Cross at 7:30PM at OLQM. It’ll be a Faith Based Day here. I will record the Stations Of The Cross On You Tube Live Streaming. It should work better than the Queens County Knights Of Columbus International Free Throw Basketball Championship Round III. OLQM Parishioners tend to watch You Tube. It was in 1996 @ Sacred Heart In East Glendale, Queens, that the 1st Ever Full Contingents from Our Lady Of Mercy & Our Lady Queen of Martyrs Parishes in Forest Hills, Queens, participated in the Knights Of Columbus International Free Throw Basketball Championship Round I. It was during this time 20 Years Ago when I met Stanley Swiatocha, who is stepping down from having to coordinate all which occurs at PS101Q for Our Lady Of Mercy Sports. In this early going, Frank Romano was Quite Key, as through Frank, I met Stanley. So, on the Wednesday, 01/13/2016, This Era comes to an end. It was in January, 1997, The Free Throw Basketball Championship Round I was in Forest Hills. The Free Throw would be held 11 Times from PS101Q in Forest Hills Gardens from 2006 until 2016. Of the 24 Council Competitions, 12 were held at PS 101Q in Forest Hills. And it has been a great run. Thank You Stanley & Our Lady Of Mercy Sports In Forest Hills, NY. No, this isn’t The Series on FOX, but a History Making Knights Of Columbus International Free Throw Basketball Championship Round, the 1st One at PS 101Q in Forest Hills, NY, in Forest Hills Gardens, a Private Community. How it will make History is that all of The Contestants will have been born entirely in the 21st Century, with the oldest contestants being born in 2001 & the youngest ones born in 2006. Next Year at the 25th Anniversary, those who were the 14 Year Olds who would turn 15 in 1992, will be age 40. This Year marks the 20th Anniversary of The Competition’s 1st Forest Hills Contestants. There were Two Queens County Champions from Our Lady Queen of Martyrs, one of whom represented Our Lady Of Mercy Recreation, while the other represented the OLQM Teen Center. Our Lady Of Mercy in Forest Hills, Queens, will be the Partner for Monsignor Sherman Council’s 24th Knights Of Columbus International Free Throw Basketball Championship Round I.
Wednesday Evening January 13th, 2016 at 7:00PM, starts an interesting evening. Though it was a Gospel Reading of Jesus Christ walking on water, it is part of The Revelation of Christ, as Epiphany means Revelation. In The Byzantine Rite Catholic Churches, this day is called Theophany, which means Revelation(Those Byzantine Rite Catholic Churches on the Gregorian Calendar, celebrate today, while those on the Julian Calendar, celebrate on January 19th(Gregorian Calendar). And those of Latino & Mediterranean Heritage, make this the Traditional Day of Gift Giving, symbolizing the Three Magi, who came with Gold, Frankinsense & Myrrh, for The Christ Child. And with Theophany, Christ is revealed as He is Baptized in The River Jordan(Latin Rite celebrates The Baptism Of The Lord 7 Days After Epiphany, which is Octave Of The Epiphany). The Traditional End of Christmas is The Feast Of The Presentation of The Child Jesus In The Temple on February 2nd(Candlemas Day). So Christmastide has a little way to gp in the Latin & Byzantine Rites of One, Holy, Catholic & Apostolic Church.